Ubuntu Nest – Matric Farewell Dress will have performances at the Hexagon Theatre in Pietermaritzburg from March 1 to 3. 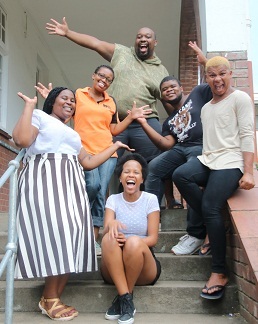 Ubuntu Nest is a musical stage production series created by veteran film, theatre and TV director, Makhubalo Cuba Ikaneng. The series is based on a myth about a magical nest where all souls go to find peace, renewal and refreshment when we sleep. The various stories of different souls that visit Ubuntu Nest is told in fantasy, music and acting as they reflect on their lives. Currently the acting coach and mentor for the Setlagole Musical Theatre on the SABC 1's show Future Leaders hosted by DJ Sbu, Makhubalo Cuba Ikaneng is a veteran TV, theatre and film director/writer/producer. Ikaneng’s career started when he directed SABC's Flagship Educational shows Take 5, Molo Show, Enterprise Zone, Buddyz on the Move, Vukuzenzele and Takalani Sesame. These shows were followed by Ba Kae? Gospel Time, Gospel Gold, The Chatroom and Hosanna. In 2010, he was appointed as producer for the SABC 1's hit youth show, Big Up. The show won a SAFTA award. Ikaneng then wrote and directed nine films for eTV’s EKASI stories including Sugar Mama, Cell 3, Ulibambe Lingashoni and No Easy Money. He then focused on producing independent films. Kitchen Girl and Vuka Lova were films for the workplace and Ubuntu and Anger was produced in uMgungundlovu District of KwaZulu Natal. Ikaneng has also written three novels with one already published. He is passionate about developing art skills and is regularly booked to be a talent adjudicator, casting director and workshop facilitator. Ubuntu Nest was launched with The Painter's Story at the Golden Horse Casino in October 2017. The second show of the series, The Ears and Heart of Time, was staged at the Wits Theatre in December 2017. This show, Matric Farewell Dress, which is third in the successful series, is about fashion, relationships and identity. It is fun, fantasy conversation starter about choices and relationships between adults and their children. In 2017 the Spread Ubuntu Campaign was launched where they painted the house of Gogo Nzuza (88 years old) at Imbali BB. This was a successful intervention that helped brighten Gogo Nzuza’s festive season. On December 9, 2017, they gave young people from Setlagole Village in The North West Province an opportunity to showcase their talents at the Wits University Downstairs theatre. These are the same young people that director Ikaneng worked with on the SABC 1 Show, Future Leaders hosted by DJ Sbu. This was done in the spirit of sharing which is one of the pillars of Ubuntu. By attending the shows, audiences are contributing to their mission of making arts without boundaries. Ubuntu Nest has appointed #Siyamthanda Cares to run the Spread Ubuntu Campaign for the production’s run at the Hexagon Theatre. Siyamthanda Cares is doing a great job searching for a deserving young woman who will wear a sponsored dress to her Matric Farewell Dress. This part of the Spread Ubuntu Campaign supported by "Oh So Chick - Boutique". Follow the journey by liking and following: #SIYAMTHANDA CARES.